1993 年的二號桶, 應該是重用桶號吧. 沒有酒精度等的重要資料, 上網搜索, 完全找不到這款酒的資料. 後來再問老友, 查詢之下得知是私人包桶, 沒有公開流出市場, 所以其資料遍尋不獲. 包桶這玩意, 可不是我等窮 L 可玩得起的, 有酒喝便喝吧. 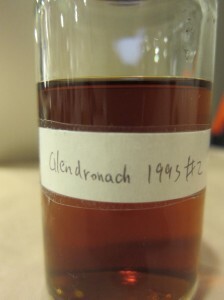 A friend of mine previously gave me a sample of GlenDronach of vintage 1993 from cask 2. 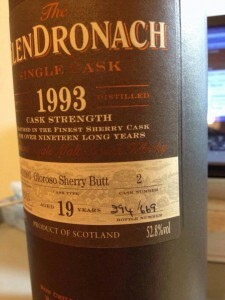 Obviously the cask number is repeated for a vintage 1993 present bottling. As there is no ABV information, I have done some Internet searching but no luck. I was then asked my freind and realized that this bottle is from a private own cask. Since it is not on sales over the market, no information about this cask is available on the network. personal owner’s cask is by no mean a game to our ordinary people. Just drink, no question asks. Comment: Rich black date sweet sense, honey baked Chinese herb and mint, acceptable sulfide, fatty toffee, followed by salty ham, balanced by little bit stone fruit. Strong body but smooth, complex and trend to charred taste. Long aftertaste, even charred and burning elements. Interesting dram, somehow its sulfide and gunpowder elements associating to Karuizawa, very good nose, complex taste and chewing aftertaste, without a doubt an outstanding dram. 英國威士忌 – English Whisky Co.